Here’s where the allergic life gets weird:I’ve been making ketchup and mustard for almost two years, ever since Big Guy’s garlic allergy was diagnosed. Let me rephrase that: I’ve been trying to make ketchup and mustard for two years. Haven’t had a lot of luck. The mustard turned out too hot or too grainy, no matter how many recipes I tried and how carefully I thought I followed instructions. I turned to buying Colman’s in a pinch, but that’s pricey for a small jar. The first ketchup recipe I tried — an allegedly easy one I found online — involved tomato paste, water and onion powder. Ick. The second I cooked for hours, but it still wound up thin. I added tapioca. Tomato pudding, anyone? The third almost worked and probably will if I try it again. I adapted it from the Ball Blue Book of Canning, omitting the garlic and doubling up on the onion. Problem was, I left the spice bag in too long, so it has a definite cinnamon-allspice aroma to it. 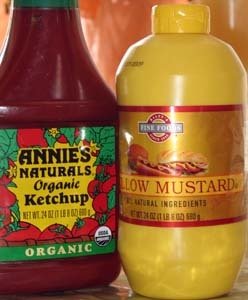 Which is why I was turning cartwheels at Raley’s a few weeks ago when I found Annie’s Homegrown Organic ketchup. Make that re-found it. I’d seen it before in the natural-foods aisle, but it contained garlic at the time. For some reason, though, I checked again. Garlic-free now! Pricey, though, at $4.29 for 24 ounces. Talks about the cost of food allergies in pocketbook terms. Which means I’ll use it for the “eating” ketchup, but continue to substitute or make my own for use in recipes such as meat loaf and barbecue sauce. Unless anyone knows of a garlic-free barbecue sauce out there. The mustard was much more affordable: The plain old, everyday Raley’s store brand. I’ve also found a store brand sans garlic at Save Mart stores in Central California. So check out your local generics. There might well be a garlic-free. So we now have garlic-free ketchup, mustard, mayonnaise and pickles. Looks like we could eat homemade hamburgers, if only Big Guy would agree to that.